previous post: World Bankspeak – how to hide the failure of a mission! I have been keeping my eye on movements in the British data to see if there is any discernable effects yet of the June 2016 Brexit outcome. The latest investment data certainly doesn’t suggest anything is going on yet. The British Office of National Statistics (ONS) reported (May 25, 2017) – that total investment spending in real terms grew by 1.2 per cent in the March-quarter 2017 and over the 12 months by 2.2 per cent. Business investment was strong. This is investment in long-term productive infrastructure. It might be argued that this spending was already decided upon some time ago so the Brexit vote may not yet have impacted. We will see about that. The latest labour market data is also positive and that is what I have been looking at for a part of today. The last quarterly data for the British labour market tells us that the unemployment rate fell to 4.6 per cent (from 4.7 per cent in the December-quarter). The Participation rate rose from 63.4 to 63.6 per cent and just about at the pre-GFC level of 63.7 per cent. Employment growth remains positive although serious questions remain about the quality of the employment being generated. 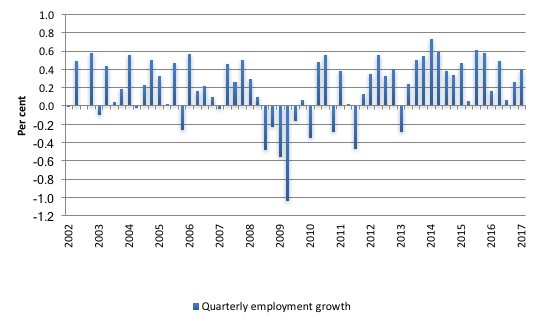 The following graph shows the quarterly employment growth since the March-quarter 2002 to the March-quarter 2017. The growth rate has increased significantly since mid-2016. So there has been improvement based on those figures. The latest ONS statement – Labour market flows: May 2017 – came out on May 17, 2017. I updated my dataset for the UK today (which takes us to the March-quarter 2017) and computed updated Transition Probabilities, which are derived from the Gross Flows labour market data. National statisticians measure these flows in their labour force surveys. In Britain, we get this data on a quarterly basis. The various inflows and outflows between the labour force categories are expressed in terms of numbers of persons which can then be converted into so-called transition probabilities – the probabilities that transitions (changes of state) occur. The probabilities crossed twice (but note the different axis) over this period – early on in the GFC when employment was collapsing and unemployment was rising quickly (September 2008) and, more recently, in the September-quarter 2013 as the labour market improved. Since then there has been a steady fall in the chance of an employed worker losing their job, while the chance of an unemployed worker gaining employment has continued to rise. 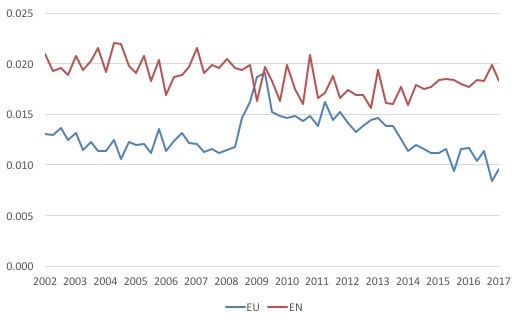 The former transition probability (EU) is now well below the pre-GFC level, whereas the UE probability has just reached the pre-GFC level. 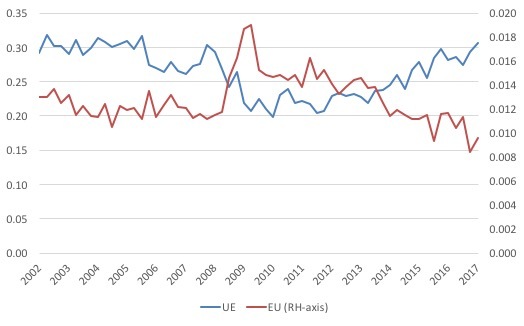 The next graph compares the UE and the UN (probability that an unemployed worker will exit the labour force) from the March-quarter 2002 to the March-quarter 2017. 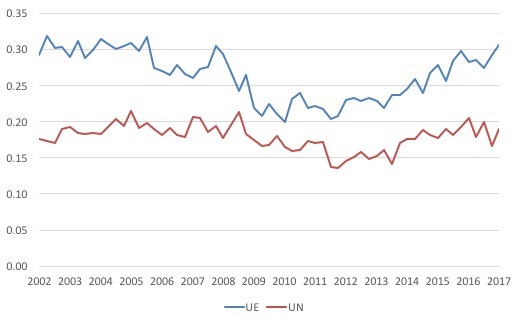 The widening gap between UE and UN is a further sign that the British labour market continues to improve (in aggregate terms). It took some four and a half years (March-quarter 2009 to December-quarter 2013) for that situation to reverse. 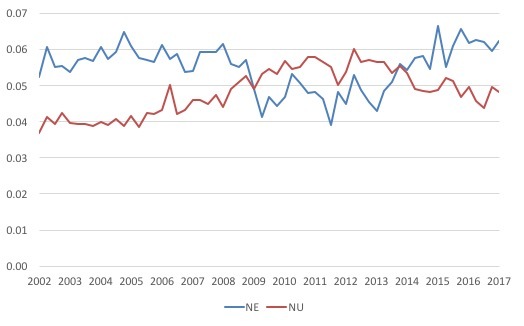 Since then, new entrants are much more likley to enter employment (NE) than unemployment (NU). The evidence is fairly consistent across a range of measures that, in aggregate terms, the British labour continues to improve. Certainly, with three full quarters of labour market data since the Brexit vote, there are no signs that British firms are going into reverse. In general, it looks like the unemployed have improved chances of gaining a job as have new entrants. These transition probabilities continue to improve. I know economists who predicted a recession by the end of 2016 have now massaged their anti-Brexit message with the “clock is ticking” claim. To which I can only say – let’s wait and see. Tonight, I am talking at the Newcastle Politics in the Pub which will be held at the Stag and Hunter Hotel, Maitland Road, Mayfield. The event starts at 18:30 and will go to about 20:00. The topic is the recent Australian government fiscal statement brought down earlier this month. I commented on it in this blog – Australian government in contractionary bias when stimulus is needed. If you are close by, come along. I’ve noticed that the UK participation rate has remained about about 63% for absolutely ages. You have to scale down to fractions of a percentage point to see any movement whatsoever. That appears very different from any other country. The detachment from the labour force just didn’t happen in the UK – at least not in the same way. The level of ‘discouraged’ people (sequence LFL8 at ONS) is tiny – it peaked at 90,000 and drops down below 30,000. This is in an economy where 3,671,000 people are wanting work and don’t have it. So about 1% of the total report as inactive-discouraged. Even as a fraction of ‘inactive – wants a job’ it’s only 1.7% of the total. Agreed, and it doesn’t feel like the picture Bill paints here on the ground. There are also huge regional differences – Tyneside, Cornwall, almost the whole of Wales where traditional manufacturing and mining industries have simply disappeared. The hi-tech jobs are all in the south-east and particularly “silicon valley” – the Thames between London and Newbury. I am lucky to be retired and have a lifestyle that is good enough for what I want out of life, if not what I was used to, but even here in the South I know plenty of people desperate for work. I seriously doubt the ONS figures. To be fair, there is a general sense of optimism. There are spanking new buildings going up everywhere. A splendid cinema complex with several restaurants just opened in Bournemouth. But I think that’s all come out of QE with more money being pumped into assets. Maybe it is just taking a long time to trickle down?